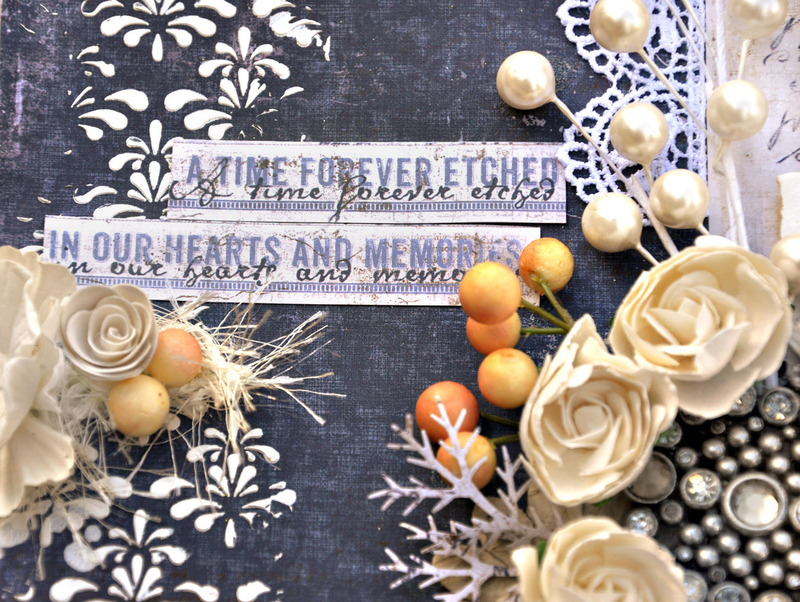 This is a layout using the wonderful Vintage Autumn Basics. My friend gave me a photo from her wedding and asked me to scrap it for her ( Photo - CR Photo, Christina and Ryan Palma). I have been waiting for the perfect papers to slid past my desk. When the Vintage Autumn Basics arrived, I let her thumb through the collection and pick the papers she liked best. Hard choice for sure. The most wonderful part of this collection is that it can be used for any type of layout you want to create - so very versatile. I found a jewelry piece that reminded me of the necklace she wore on her wedding day as the center of my cluster. I also added some masking on this piece using a stencil and super heavy gesso. The Maja Design papers have the most wonderful paper strips on the bottom of each page. Have you ever noticed? I used the strip of the bottom of Vintage Autumn Basics XXIII BAS646. It says "A time forever etched in our hearts and memories. " Perfect for a wedding layout. Thanks so very much for sharing your time with me. 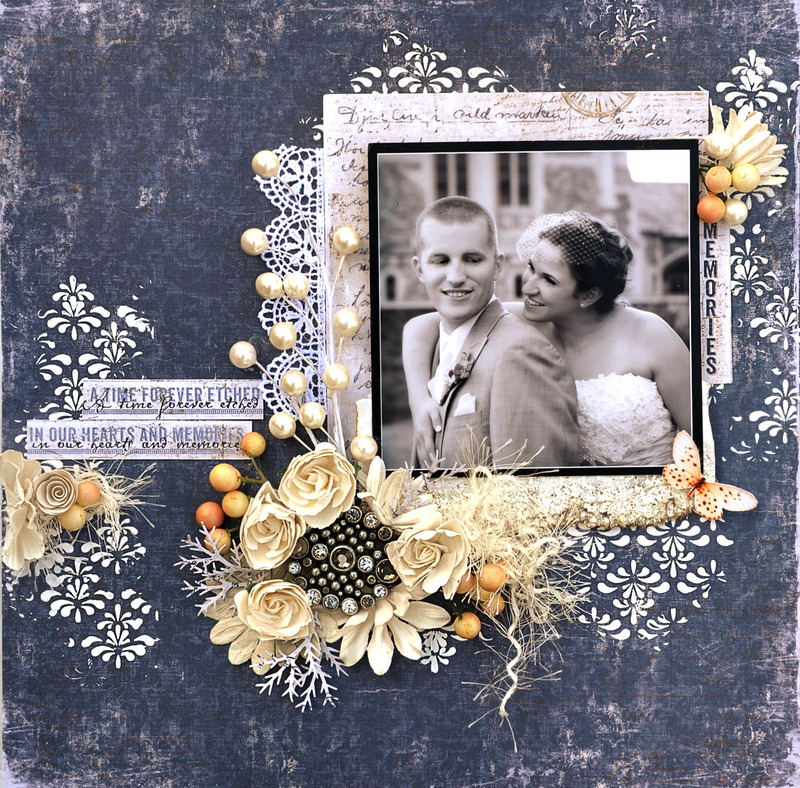 Such a stunning layout.mi love all of the embellishment..they are amazing! This is such a beauty from you Jennifer...so elegant! Your layout is just beautiful Jennifer. Lovely colours. Thanks for sharing!! 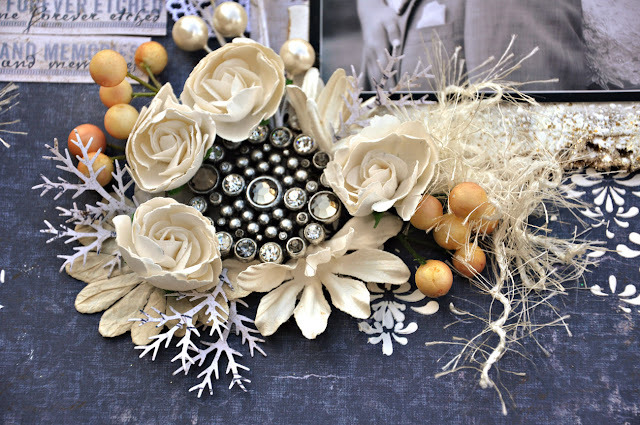 Fabulous wedding page - love the details!